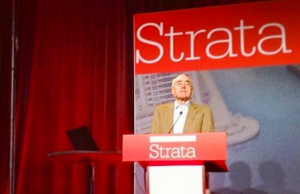 At Strata last week, science historian James Burke gave a brilliant keynote. Afterwards, we had a coffee break for members of the media, during which he expanded on some of the things he’d said on the main stage. Put another way, a single truth is a consequence of having no way to manage a diversity of opinion, which is something the Internet has given us in spades. After hearing Burke, it occurred to me that likes, retweets, and upvotes are ways of deciding what today’s truth might be. To believe Burke (as he is paraphrased here) means having to believe there is no objective truth, in which case there is no truth at all, in which case there is no alternative to historical revisionism. I sort of balked at that too. But he meant “truth” as in “what the humans believe now”, not in a “the earth is flat because we want it to be” way. I actually challenged him on the flight from objectivism; he was pretty clear that it’s a forum for debate, but once there is good proof, we should probably get behind an idea. ““what the humans believe now” and “the earth is flat because we want it to be” tend to be the same thing. We all start with an underlying worldview that determines what we *can* believe, and that gets inculcated in early childhood at an unconscious reflex level. Programmers have the phrase “Religious Argument”, used in discussion to flag things that simply *won’t* get agreement, because the underlying viewpoints are emotional, not rational. (The canonical example is whether vi or emacs is the One True Editor on unix systems.) Things embedded on an emotional level generally aren’t amenable to rational argument. Burke’s notion still rubs me the wrong way, mostly because I feel the idea of Truth as something historically imposed by the rulers to control the people oversimplifies what was really going on. Preservation of control by the rulers was a side-effect. The purpose was cohesion of the society. But the transition of society from scarcity to abundance is something I’ve been thinking about a lot lately. On the one hand, the spread of the Internet, the improvement in technology, and the advances in robotics are making whole classes of jobs obsolete, and those made redundant aren’t likely to get new jobs because they don’t know how to do the new jobs being created and may not be able to learn. On the other, a society of abundance means there should be enough to go around that you don’t have to have a job simply to attain what is needed to survive. Decades ago, Buckminster Fuller talked about the need to abolish the idea of “working for a living”, and as usual, he was prescient. Different cultures have different ways of conferring and displaying status, but we’ll always *have* status. After you have the basics of survival covered – you’re alive and healthy, with food on your table, clothes on your back, a roof over your head and some confidence that state will continue – your next concern will be “How am I doing relative to others?”, with a corresponding desire to gain more status and protect what you already have. The two questions I see are how our society transitions to one where you *aren’t* expected to “work for a living” to get the necessities, and what the “something else matters” might be. If your status isn’t tied to your material wealth and what you do for your living, what will it be based on and how will it be displayed? I have no idea, but I think those are the two most important questions to be asked.